As a goat owner, you're likely aware that pregnant does can die during the birthing process, they can produce insufficient milk for nursing, and they can flat out reject a kid after he is born. When a goat kid is orphaned, you'll need to find a suitable replacement doe to take in the orphan and care for him as her own. A doe who has just lost her own kid is more likely to take an orphaned kid in than a doe who has not produced a kid in months or years. The younger the kid is when you attempt to introduce him to a surrogate mother the more likely they both are to accept the match. Your best chance for getting a doe to accept an orphaned kid is to introduce the kid to the new mother as soon as you can after the kid is born. Traditionally, it's easier to get a doe to accept an orphaned kid if her own kid died recently. You can skin the deceased goat kid and tie the skin onto the orphaned kid so that the deceased kid's smell covers that of the orphan. You can also rub the fetal membranes, also known as afterbirth, of the doe's biological kid onto the orphan. The purpose of these methods is to trick the doe into believing the orphan is her own kid. By replacing the orphan's smell with the doe's smell, you stand a good chance of convincing the doe that the kid is hers. A doe who has not produced a kid recently and has not been milked in the interval might not have milk. Some does stop producing milk within a few weeks after their kids have been weaned. Other does may take months to dry up completely. Does will continue producing milk for as long as their milk is in demand. A doe who is being milked daily is going to produce adequate milk to care for a kid, even if she has not birthed a kid of her own recently. If the doe you want to use as a surrogate mother has not produced a kid recently, you will have to cover the scent of the orphaned kid to prevent the doe from rejecting the orphan when you introduce him to her. You can cover the muzzles of both the doe and the kid in a strong-smelling, nontoxic substance such as aniseed or sump oil. Commercial products designed for use on orphaned sheep and potential surrogate mothers can also serve goats. In some cases, you may be able to get a doe who has a single kid to accept a second kid to raise alongside her biological baby. If you are trying to get a doe to accept a second kid, one who is not hers, you will need to make the orphan kid smell like the biological offspring. Make sure your doe is producing adequate milk to feed both kids. Supplement the doe's milk as needed with formula if you are concerned that the kids may not be getting adequate nutrition. Closely supervise your doe and kid during the adoption introduction period. 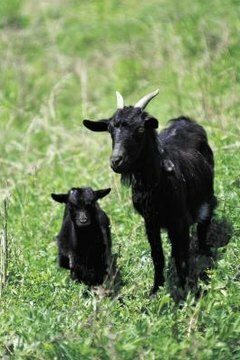 Keep the doe and kid together in a darkened stall, without any other goats around to interfere in the new relationship. Make sure to hold the doe still several times a day and allow the kid to nurse. It is crucial that the orphan kid gets to nurse from your doe, not just because the kid needs the nutrients from the milk but also because the nursing process helps build a bond. Keep an eye on the pair when you release them back out into the field to make sure the doe continues to care for the kid as time goes on. If you are worried that your kid is not getting enough nutrition, supplement his diet with formula designed for use on goats.